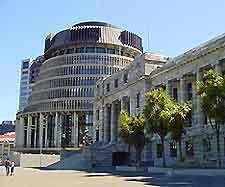 None of the world's national capitals lie further south or further away from any other national capital than Wellington, New Zealand's premier city. Centuries before Wellington became the city's European name, Maori legends referred to the area as 'Te Upoko o te Ika a Maui,' which roughly translates as 'the head of Maui's fish.' In the mythology of the Maoris, Maui was a Polynesian navigator solely responsible for the creation of New Zealand's North Island. He apparently 'pulled' the island out of the sea from a vantage point on the South Island, although Maoris living on the North Island generally contend that it was actually the other way around. The first people who officially settled here were two Polynesian explorers named Ngahue and Kupe, who camped at the harbour's south end roughly 1,000 years ago. However, it was the famed Maori navigator Whatonga and two of his sons who established the first permanent settlement in Wellington, or 'Te Whanganui a Tara,' as many Maori still call New Zealand's capital today. By the time the first Europeans set eyes on Wellington in 1839, numerous Maori settlements already lined its harbour shores. 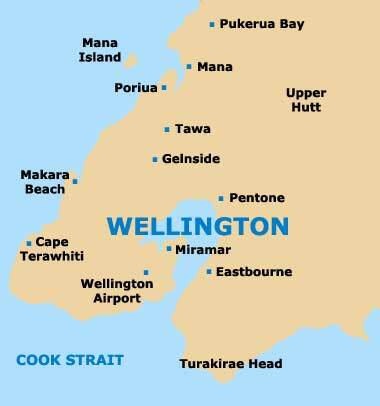 Not long after Wellington was first established as a planned town in 1840, several earthquakes rocked the new community in 1848 and again in 1855. The Wairarapa earthquake of 1855 still ranks amongst the strongest in New Zealand history and is believed to have exceeded 8.0 on the Richter scale. Much of Wellington had to be rebuilt following the earthquakes. Interestingly, the previously harbourside street of Lambton Quay now sits some 200 metres / 655 feet inland from the actual harbourfront of today, due to the appearance of new raised swampland (later drained and reclaimed) from the ocean as a result of this powerful seismic activity. Of note, the line of the previous waterfront is marked by a series of plaques along a pathway adjoining Lambton Quay. Most of the city's buildings have been built predominantly from wood since these earthquakes. Wellington replaced Auckland as New Zealand's national capital in 1865, simply because it was situated closer to the South Island, the more populated of New Zealand's two main islands at the time. More than 50 years after Wellington became the birthplace of the 40-hour working week movement, New Zealand became the world's first country allowing women to vote in 1893. New Zealand still remains one of the world's most socially progressive nations. 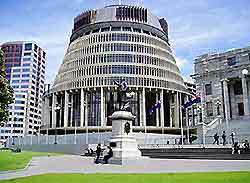 Many tourists may overlook Wellington as a dull city whose only attractions are its Parliament and Government Buildings, the Southern Hemisphere's biggest wooden office buildings. However, the city boasts an enormous, picturesque, natural harbour, which was the scene of one of the most tragic events in the history of Wellington. On 10th April 1968, the Wahine inter-island ferry capsized and sank on Barrett Reef, at the harbour entrance, during a 'storm of the century'. This resulted in the death of more than 50 people who had set sail from Lyttelton, near Christchurch. The story is told in the excellent Museum of Wellington City and Sea on Jervois Quay, along with many other key events in New Zealand's history.